This has been the most popular selling bed for the past 3 years. Its stylish good looks, modern design and powerful performance leaves the traditional flat square looking beds on the production line. Its Curved Canopy helps get to those hard to reach side areas better than the old flat beds. The single canopy comes with a sturdy metal stand and four wheels. Ideal for placing the bed upright and pushing out of the way when not in use. The Stand is also adjustable to suit different bed heights. It can also be dismantled in less than a minute and stored away. 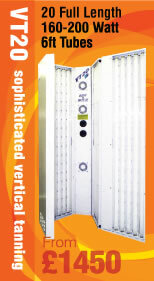 This range comes in a 100 watt or 160 watt version but can be upgraded to 180 or 200 watt call for details. A great value bed for the infrequent user or for those people who like to spend time relaxing under their sunbed. This bed has a 30 minute timer fitted as standard and 9x6 ft RUVA 100 Watt tubes. Same bed as the 100 Watt but with more powerful 160 Watt RUVA tubes. These beds come with 10 minute timers as standard, full acrylic safety screen and cooling fan in the canopy and 4 facial tubes. Curved to promote an even all over tan. Fully adjustable, spring assited stand. Cooled by high capacity fans to ensure an even temperature throughout for greater comfort and efficiency. Tanning instruction and all relevant warnings fitted to each bed. Full body coverage with total surround and fully hinged door.